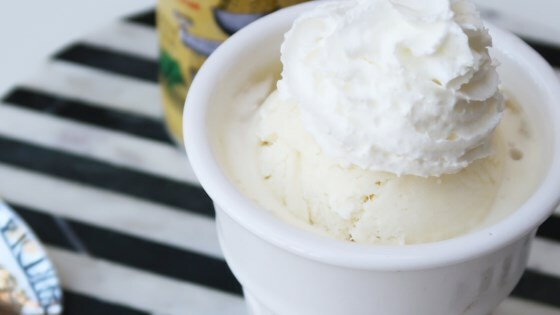 "This homemade pineapple ice cream is reminiscent of the infamous 'Dole Whip' at Disney®. This version packs great pineapple flavor but it more smooth and creamy. Make this a float by dishing the ice cream into a glass and pour pineapple juice over it and top with whipped cream. This is a refreshing summer treat!" Whisk cream, pineapple juice, and sugar in a bowl until sugar is dissolved; stir in lemon juice. Refrigerate until well chilled, at least 6 hours. Transfer pineapple mixture to an ice cream maker and process according to manufacturer's instructions. 4.10.17 Really tasty, creamy homemade pineapple ice cream. Quick and easy to make with texture similar to soft-serve. Not too sweet, with the pineapple flavor the star!